Who would have thought that it’d be only 2 months into the new year before I saw the movie that could really be the best movie I see this year, the first near-perfect film of they year already being released? Martin Scorsese nails all of the right notes for a truly awesome turn at the psychological thriller in his adaptation of the novel “Shutter Island”. It’s been a long time, if ever, that a movie has blown my mind and kept me so interested in where it’s going to take you next. I’ll be amazed if I any love any other movie (aside from Christopher Nolan’s film “Inception” also starring Leonardo DiCaprio) more than I did Shutter Island and affects me the same way. The film’s a period piece that is set in 1954. 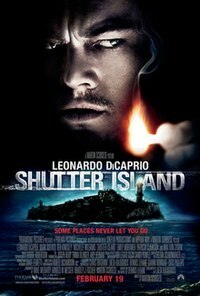 Following the investigation of U.S. Federal Marshall Teddy Daniels, setting out with his partner Chuck Auie to look into the disappearance of one of the patients of Shutter Island (a mysterious and haunting mental institution in the middle of nowhere). The female patient, as Daniels digs further and further, is one of the most disturbed as she had reportedly drowned her three children and had believed her surroundings to still exist in the way it had before her heinous deeds, as if nothing had ever changed. This makes the mystery all the more terrifying when it appears the staff is covering up the conspiracy and even darker secrets exist on the isolated island. While at the same time Teddy is haunted by his wife’s death years ago in an apartment fire and his own past involved in uncovering the darkest revelations in World War 2. As the film goes on and on closer to the end, the plot and more importantly the mysteries, not to mention the sheer moral complexities and questions of right and wrong, guilt, and the burden of life continuously grow exceedingly deep and compelling. You get to the point where you’re begging to find out more and more about what exactly is going on, and where exactly this unpredictable, unstable, and disturbing thriller is going to take you next. It never puts you off though as to how dark it can be, you just become all the more invested in what will come next to these characters and you care even more about where they’ve came from, all until the very end when the story throws itself on its head. Scorsese proves he’s a master of cohesive direction and rewarding storytelling, perfectly executing the unique way this plot plays out in a way that’s easy for the audience to understand without talking down to them. 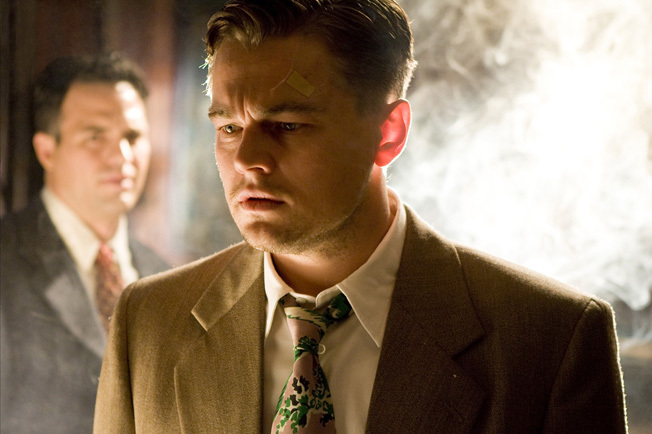 Although at times the mystery isn’t as compelling as it wants to be, even at its worst Shutter Island’s mystery and story is miles better than most movies at their best. Leonardo Dicaprio, revelling throughout the movie as a marshall beginning to struggle with his own mind as he investigates the troubled souls of others on the island. He’s just really awesome in this as the mystery (and his “expert cop” composure) begin to unravel, including his continuous hallucinations of his deceased wife, who serves as his not-so-moral compass. Ben Kingsley really proves an incredible performance as the subtle, kind, but always thinking lead psychiatrist at the island, and Mark Ruffalo does some awesome work with what he has as the somewhat-one-dimensional partner. Ted Levine (Captain Stottlemeyer, “Monk”) appears unfortunately really briefly as the warden of Shutter Island in an impeccable monologue about the “predestined violence” in human beings and how “the Lord made us with violence in mind”, and it’s amazing at the end of the film as it takes us out of the action for a few minutes and gives us perspective as to what’s been going on for the past 2 hours. It’s a shame he wasn’t given a larger role, but his ambiguity proves a strong contribution to his character. The thing I really wanna point out though is the 10 minute stint Jackie Earle Haley (A Nightmare on Elm Street 2010, Watchmen) has in the film as George Knoll, one of the more disturbed patients of Shutter Island who gives Daniels direction as to where to head next at the 2/3rd mark, is absolutely amazing as a patient Daniels had ran into earlier in the film, and does a great job with what he has, as always, just proving Haley is a tour-de-force of an actor. Whether it’s wide scoping shots, that really show off the odd beauty of the terrifying island, or the way the atmosphere/tone painted by Scorsese, whether that’s the horrific panning camera shots in the dark, dismal corridors, the wider shots of the varying landscape of the island, or at its best what can become a crippling suspense as you realize the darker truths of Daniels’ or the Island’s past. This is one really well-made movie, it’s one that reminds me what a great movie can be, it makes me love movies again. As the final climax began to unfold I looked over at my friend, caught up in the winding suspense, and said “more movies like this need to be made”. This is a modern classic, a film that needs to be seen just to support this kind of expert filmmaking. This is a psychological wonder that creates a stark atmosphere, throws in some perfect performances not just by DiCaprio but by some impeccable supports like Haley, and offers the American audience a disturbing tale that shows us some insight on mental illness and modern violence. This has to be my favorite thriller in a long time, and just cannot be missed.